Last week's challenge: Take the first and last names of a famous comedian. The first three letters of the first name and the first letter of the last name, in order, spell the name of a god in mythology. The fourth letter of the first name and the second through fourth letters of the last name, in order, spell the name of another god. Who's the comedian, and what gods are these? If you know the answer to next week's challenge, submit it here. Listeners who submit correct answers win a chance to play the on-air puzzle. Important: Include a phone number where we can reach you Thursday, Jan. 19, at 3 p.m. ET. After a momentous week in news, let's tune out of politics for just a moment and tune into The Puzzle. GARCIA-NAVARRO: Will Shortz is the puzzle editor of The New York Times and WEEKEND EDITION's puzzlemaster. GARCIA-NAVARRO: Remind us of last week's puzzle. SHORTZ: Yeah, it came from listener Peter Collins of Ann Arbor, Mich., - sounded a little more complicated than it was. I said, take the first and last names of a famous comedian. The first three letters of the first name plus the first letter of the last name, in order, spell the name of a god in mythology. The fourth letter of the first name plus the second through fourth letters of the last name, in order, spell the name of another god. Who's the comedian and what gods are these? And the answer was Martin Short, which works out to Mars and Thor. GARCIA-NAVARRO: Mars and Thor. We received nearly 1,100 responses. And the winner is Michael Konopka of Akron, Ohio. GARCIA-NAVARRO: So how long have you been playing The Puzzle? KONOPKA: I've been playing The Puzzle off and on since the postcard days when I was a young kid listening to it in my parents' car on the way to church on Sunday. GARCIA-NAVARRO: Wow. And I hear solving this week's puzzle was a family effort. How did you do it? KONOPKA: It was. So my wife, Catherine, she started thinking of names of gods that were four letters. And we came up with - thought that Mars, M-A-R, would be the most likely to be a first name. And I got Martin Short from that. But it was really my son, Will, who kept reminding us to enter - that I kept forgetting. And so it was the last day that I entered. And luckily enough, I was selected. GARCIA-NAVARRO: Glad that he pressured you because you are our winner today. And are you ready to play The Puzzle? SHORTZ: All right, Michael and Lulu, today I brought a game of categories based on the word combs. And you probably know how this works. I'm going to give you a series of categories. For each one, name something in it starting with each of the letters, C, O, M, B, S. For example, if the category were three-syllable boys' names, you might say Christopher, Oliver, Mathias, Benjamin and Sebastian. Any answer that works is fine, and you can give the answers in any order. SHORTZ: So your first category is musical instruments. KONOPKA: Oh, yes. Oh, oboe. SHORTZ: Bongo, good - M and S.
SHORTZ: Nice job. Category number two is cities in Florida. KONOPKA: We'll go Orlando, Miami. GARCIA-NAVARRO: I'm actually from Florida and I'm blanking (laughter). KONOPKA: OK. Wait, isn't there, like, a Sealand (ph) or - I can't remember. Trying to think of C.
KONOPKA: Oh, there's a good one. KONOPKA: I think there is. SHORTZ: And St. Petersburg, St. Augustine and Sarasota would work. All right, try this one - wild mammals in America. SHORTZ: Badger, nice. I didn't think of that one. SHORTZ: O, M and S.
SHORTZ: Otter, yes. Mountain lion, yes. All you need's an S.
SHORTZ: And there's an S that runs around my yard all the time. SHORTZ: ...But skunk's also good. And here's your last category - people and things seen in a church. KONOPKA: Musial (ph). Missal. Bible. SHORTZ: OK, also minister. Bible is good. All you need's an S.
KONOPKA: Let's go string guitar? GARCIA-NAVARRO: I would say sacraments. SHORTZ: Sacraments, nice. And I had stained glass window. OK, nice job. GARCIA-NAVARRO: Those were fun, actually. I enjoyed that, although being from Florida, it's embarrassing that I didn't get more of those. 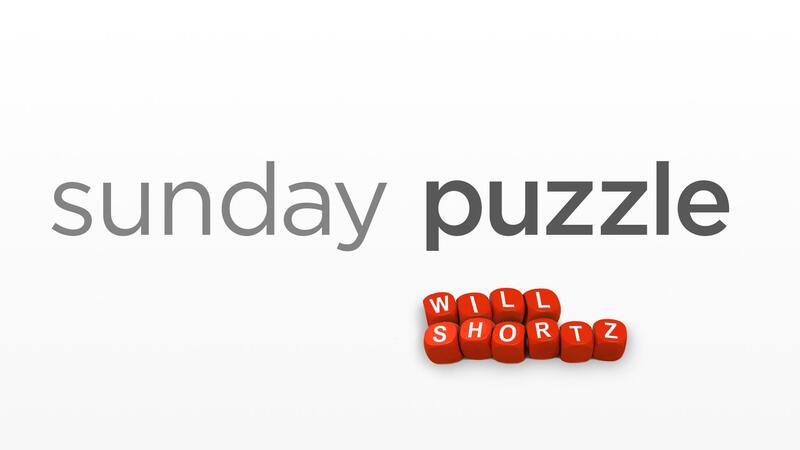 For playing our puzzle today, you'll get a WEEKEND EDITION lapel pin as well as puzzle books and games. You can read all about it at npr.org/puzzle. Michael, what member station do you guys all listen to there? GARCIA-NAVARRO: Michael Konopka of Akron, Ohio, thanks so much for playing The Puzzle today. KONOPKA: Thank you very much for having me. GARCIA-NAVARRO: All right, Will, what's the challenge for next week? SHORTZ: Yeah, it's an unusual one. It comes from Dan Pitt of Palo Alto, Calif. The numbers 5,000, 8,000 and 9,000 share a property that only five integers altogether have. Identify the property and the two other integers that have it. So again, the numbers are 5,000, 8,000 and 9,000. They share a property that only five integers altogether have. What's the property and what other two integers have this? GARCIA-NAVARRO: When you have the answer, go to our website, npr.org/puzzle, and click on the Submit Your Answer link. Just one entry per person, please. And our deadline for entries is Thursday, January 26, at 3 p.m. Eastern. So include a phone number where we can reach you at that time. If you're the winner, we'll give you a call, and you'll get to play on the air with the puzzle editor of The New York Times and WEEKEND EDITION's puzzlemaster, Will Shortz.